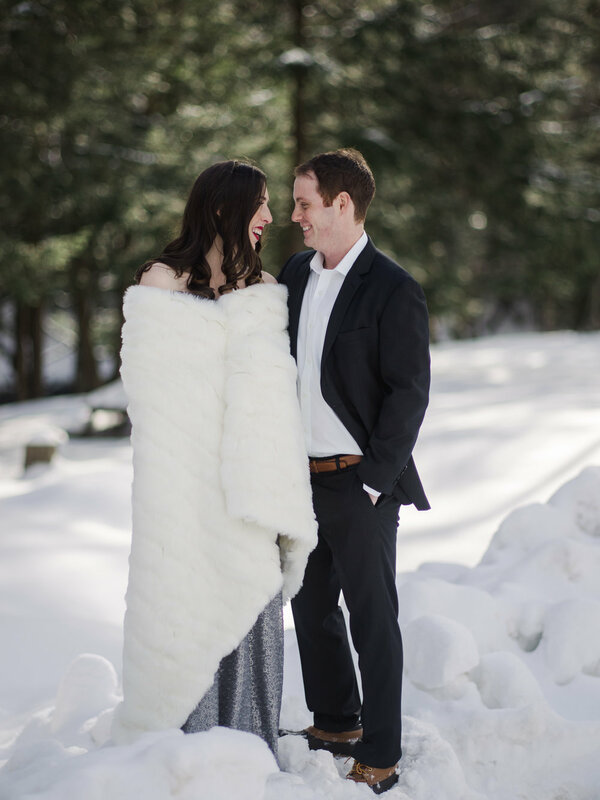 As we looked through Kim and Brian’s gorgeous snow day engagement shoot, we realized that this photo shoot was the perfect example of an engagement shoot that was planned and executed perfectly. 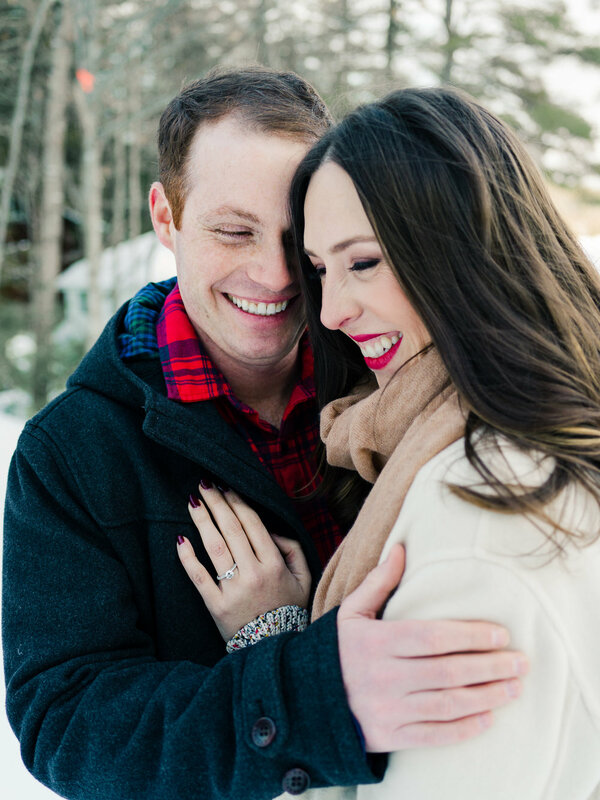 Are you preparing for your upcoming engagement shoot? Here are some things to keep in mind as you prepare for the day. Do you have a vision? Kim had a very clear vision for her engagement shoot. She knew she wanted a beautiful, snowy backdrop. She knew that she wanted to use two different outfits - 1 casual and cozy, 1 elegant. 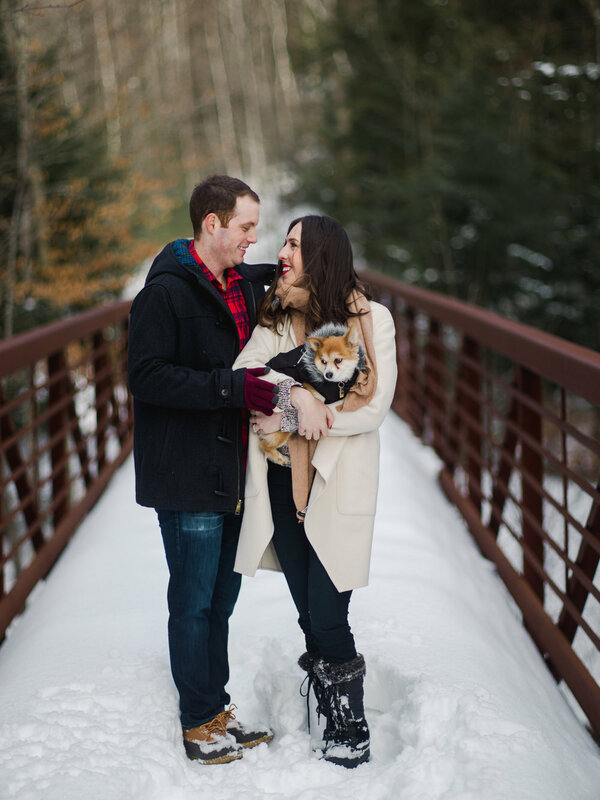 She knew that she wanted to include her pup, Firecracker, in their shoot. 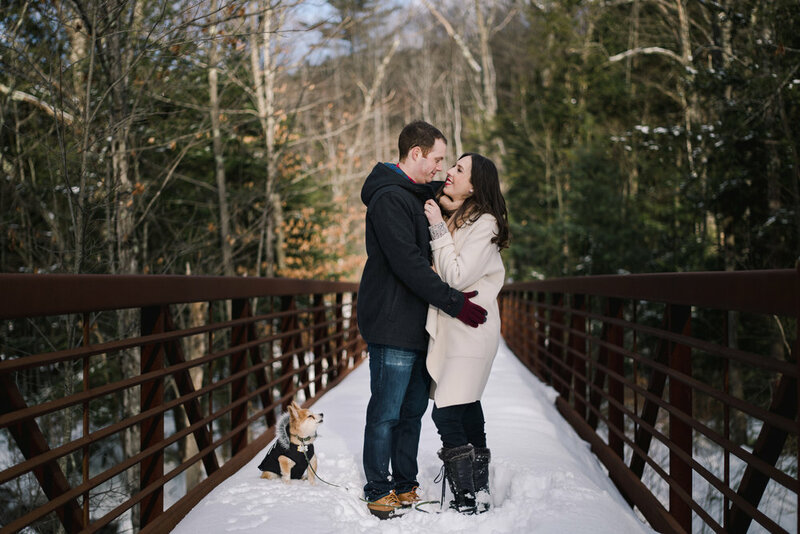 In vocalizing her dream engagement shoot situation well in advance of the day, she and her photographer, Libby Nelson of All The Little Stories Photography, came up with a stellar plan that involved some location scouting, some weather watching and lots of warm attire preparations. In knowing her vision for the day, Libby knew what her client expected and she could add her own creative feedback in a way that helped to elevate the shoot. 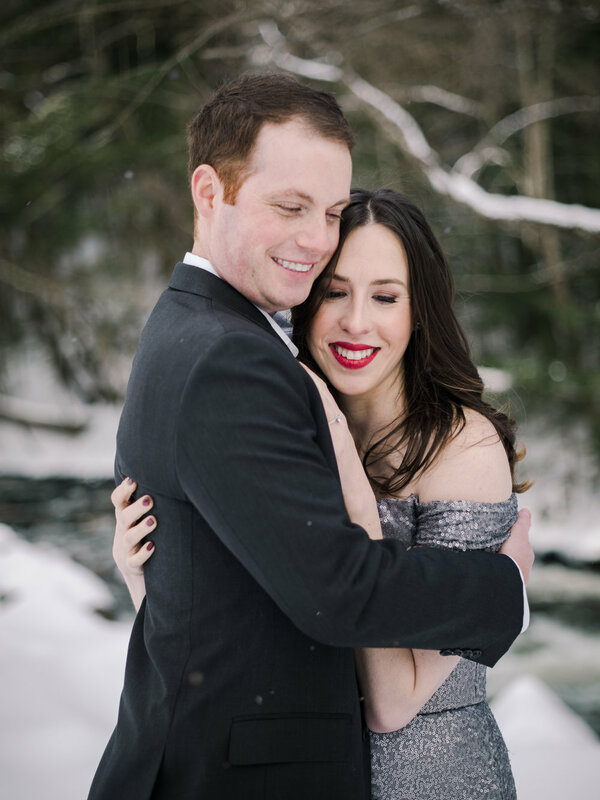 Work with your photographer - As you plan for this shoot day, be aware that this is the perfect opportunity to get to know your photographer BEFORE your wedding day. Ask your photographer if they might be up for meeting for lunch or a drink before the shoot begins. This will give you time to relax and to get to know one another better (you may not have spent much time together since you booked them) and of course, having a cocktail or glass of wine before the shoot begins may help to calm any nervousness you feel about being in front of the camera. Shooting outdoors? Have a back-up plan - If your vision involves being outdoors in any season, work with your photographer to come up with a back-up plan in case of bad weather. Whether this means moving to an indoor location or having a back-up date on the calendar, consider all possible weather scenarios for the day. Consider planning your hair and makeup trials around the photoshoot - If you plan to do a hair and makeup trial (ALWAYS do a trial!!) consider planning the trial for the morning of your photoshoot. Not only will you look AMAZING in your photos, but this will also give you an accurate sense for how you will look on-camera on the wedding day. After the shoot, plan a nice night out for you and your betrothed. Why not - you already look fabulous! Stay off of Pinterest! - Don’t fall in love with engagement shoot ideas that you find on Pinterest. Be creative and personal in your vision for the shoot. This should be a perfect opportunity to make use of places that you and your significant other love. Location. Location. Location. - That brings me to my last point - picking the perfect location. If being outdoors isn’t your thing, maybe your favorite local bar or restaurant serves as a comfy location. Perhaps your own home is the place where you feel most comfortable. Do you both love going for walks through your neighborhood? 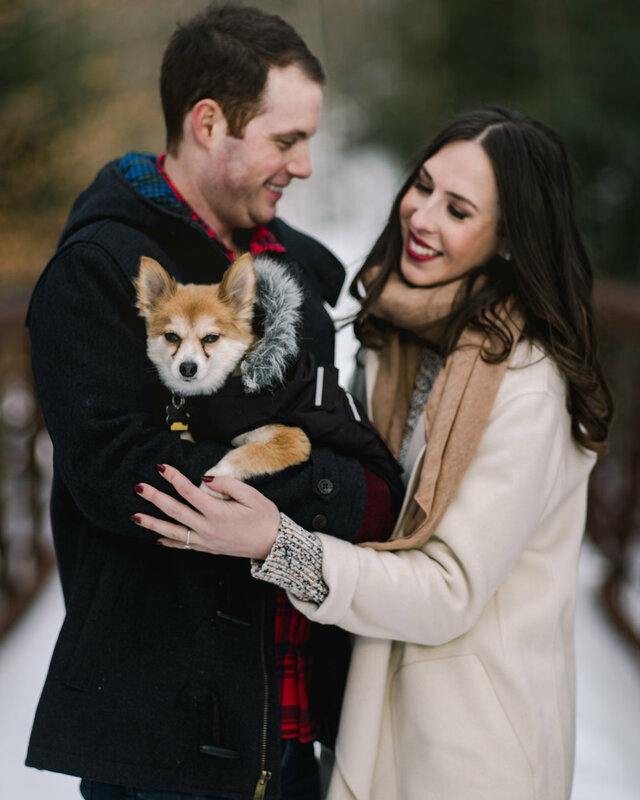 Make this a part of your engagement shoot! Just be aware that if you plan to shoot inside an establishment like a restaurant or place of business, you may need to call ahead (or have your photographer call ahead) to make sure this is approved by the establishment. And plan to go during a quiet time so that you aren’t fighting for space. Have fun! Be yourselves! Take the time to get comfy in front of the camera and yes, you will feel a little weird at first but you’ll relax into it. Most of all - enjoy the excitement of preparing fo your big day.